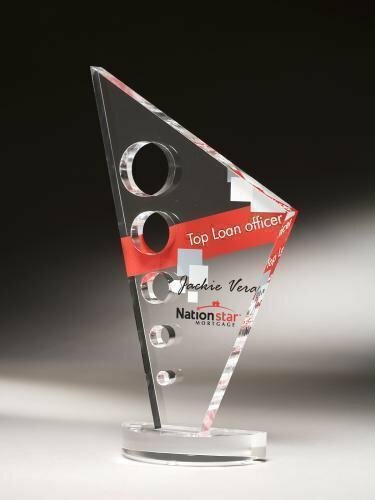 Elegant is the only term that one can use when describing these Corporate Acrylic Eagle Awards. 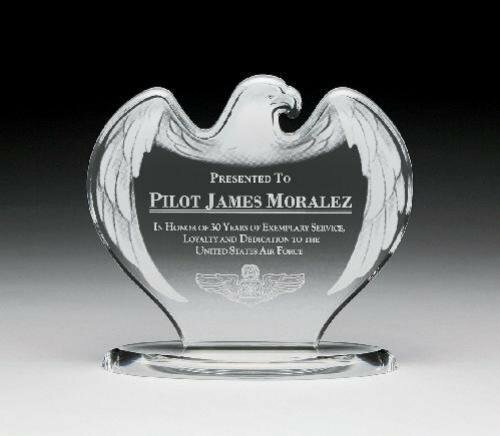 A unique look of an eagle with its wings spread wide and head turned to the side are frosted to make it really stand out while body creates large engraving or laserable area that can accommodate any of your personalization needs. The matching acrylic base completes the look. Flexibility is a key component for these awards that come in your choice of three sizes 6 3/4", 7 3/4" or 8 3/4" and are available in your choice of clear, jade, or blue finish. A white presentation box completes these fine awards that anyone would be proud to give or receive. The Faceted Mountain Cut's iconic shape and design make it a very versatile acrylic award, perfect for any occasion. Available in your choice of blue, red, green, gold or purple reflective bottoms. No need to hit your employees over the head with the knuckle bones acrylic award. Simply present it and let them know they are rock solid in their work and efforts. Image shown with full color imprinting, available as an optional imprinting method to this acrylic award.